Any woman who has found herself incapacitated with headache pain during her period has probably already made the connection between headaches and hormones, which shift up and down over the course of the menstrual cycle. Similarly, hormonal levels fluctuate heavily as a woman approaches menopause, which can spark painful headaches. However, other lifestyle and psychological factors can trigger headaches. For a better understanding of the hormonal causes of headaches, read below. Women experience headaches five times as often as men. Up to 30% of premenopausal women report headache pain, and 70% of these women report that most of their severe headaches occur just prior to menstruation. The data make it difficult to deny the connection between female hormones and headaches, especially during perimenopause, the two to ten year period leading up to menopause. As menopause approaches, women's estrogen and progesterone levels surge and dip prior to receding to a low level once she passes through menopause and no longer has a menstrual cycle. This estrogen imbalance is known to affect the brain in various ways, including the onset of headaches. There are two main triggers for hormone-related headaches: headaches are caused by declining estrogen levels and headaches are caused by elevated estrogen levels. Dramatically-fluctuating estrogen levels just before menopause can cause both types of headaches. Many doctors believe that a long duration of significantly increased levels of estrogen, followed by a sudden drop in hormones, such as the time just before menopause, will cause more severe headaches than even menstrual headaches. Some women report more frequent or more severe headaches when taking birth control pills. This is thought to occur because birth control pills introduce hormones into the body, affecting hormone levels. While the reason hormonal fluctuations cause headaches during menopause is still inconclusive, most researchers agree it has to do with the effects that hormones, such as estrogen and progesterone, have on the brain and its blood vessels. Estrogen causes blood vessels to dilate, while progesterone causes them to constrict. 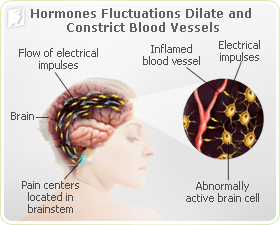 As the hormones fluctuate, the blood vessels are forced to expand and contract, resulting in pain in the head. Read below for additional causes of headaches during menopause. Although hormonal imbalance is the primary cause of headaches in menopausal women, there are other factors that can either trigger or exacerbate headaches. Below are triggers that can cause headaches. Continue reading to find out when to consult a doctor for particularly severe headaches. Headaches, particularly migraines, are never pleasant, but there are times when a headache requires medical attention. If any of the following occur, visit a trusted medical professional. Headaches are the most common type of head pain that causes sufferers to see a doctor. Fortunately, a woman can take many simple steps toward managing headaches on her own. Click on the following link learn more about the different treatments for headaches. Headaches occur when blood vessels dilate and constrict. Certain foods can cause headaches, like processed meats and aged cheese, because some people have reactions to certain compounds contained in them. It is important to maintain a healthy diet and to stay active in order to avoid headaches. Causes of migraines in menopausal women can include anything from excessive stress and dehydration to lack of sleep and insufficient exercise. 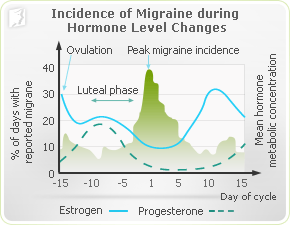 Hormone fluctuations women experience during the menopause transition are the primary cause of migraines. It is important to maintain a healthy and active lifestyle in order to prevent menopausal symptoms. Migraine symptoms affect around 29.5 million Americans. The leading cause of menopausal migraines in women is hormone fluctuations.There are 3 main approaches that can help you deal with menopausal migraines.Read on to learn more about migraine triggers during menopause and how to handle the symptom.